Welcome to the Regency Golf Villas. 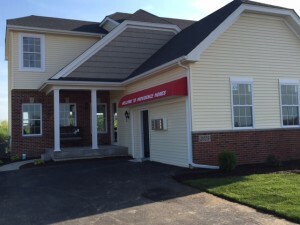 These maintenance free paired villas are located in the picturesque neighborhood that borders the prestigious Youche Country Club and is just minutes away from the historic Crown Point Square, the fairgrounds, YMCA and St. Anthony’s Hospital. The Villas offer an open concept floor plan with 3 beds and 2 1/2 baths, a lookout basement and a deck to enjoy the beautiful views. *Monthly payment based upon base price (includes principal/interest). Payment amounts do not include taxes, insurance or monthly private insurance. Payment offered thru preferred lender, for a 30 year fixed rate FHA 3.75%, APR 4.68% with a minimum down payment of 3.5% or conventional 30 year fixed rate of 3.75%, APR 4.22% with a minimum down payment of 5%. Rate subject to change without notice. Buyer must make a loan application within 7 days of contract signing. Buyer must meet all requirements of applicable program. Property must be owner occupied. Other terms and conditions may apply. See a sales representative for details. Prices, offers, and financing are subject to change or termination at any time without notice.